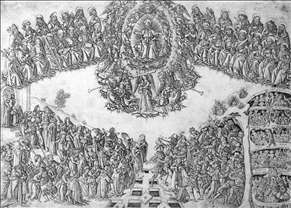 Italian engraver, illuminator, cartographer and painter, part of a family of artists, brother of Cosimo Rosselli. The family was active in Florence during the 15th and 16th centuries. Francesco Rosselli apparently trained as an illuminator; in 1470 he was paid for three historiated initials for a Gradual for Siena Cathedral (Siena, Biblioteca Piccolomini). Stylistically, these are close to the work of Francesco di Antonio del Cherico, who may have been Francesco s master. In 1480 Francesco was in Hungary, possibly working for Matthias Corvinus, King of Hungary and a great patron of books and manuscripts. By 1482 he was apparently back in Florence. He may have fallen under the influence of the Dominican preacher Girolamo Savonarola in the 1490s. He was recorded in Venice in 1505, and again in 1508, when he attended a lecture given by Luca Pacioli on Euclid. Rosselli s cartographic work has not been recognized until relatively recently. He produced the very first map to show the land discovered by Columbus. At the time Rosselli painted his extraordinary world map (measuring just 15 x 28 cm) cartography was still a new and experimental art. 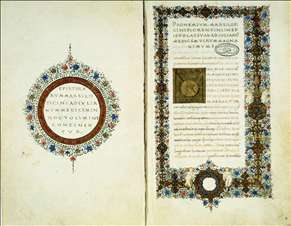 See more details about "View of Florence with the Chain"
See more details about "Page from Marsilio Ficino's Letters"